202 pages | 28 B/W Illus. The devastating impacts of natural disasters not only directly affect humans and infrastructure, but also animals, which may be crucial to the livelihoods of many people. This book considers the needs of animals in the aftermath of disasters and explains the importance of looking to their welfare in extreme events. 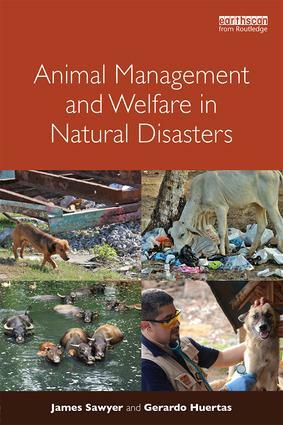 The authors explore how animals are affected by specific disaster types, what their emergency and subsequent welfare needs are and the appropriate interventions. They describe the key benefits of management of animals to populations and discuss preventative measures that can be taken to reduce risk and build resilience. They also include a summary of recent debates and public policy advances on animals in disasters. The book covers livestock, companion and wild animals, with case studies to show how the concepts can be put into practice. It provides a standalone text for students of disaster studies and management as well as professionals and NGOs who require an entry-level introduction to the subject. Why Help Animals in Disaster? James Sawyer currently works as Director of Programmes at CDP, formally the Carbon Disclosure Project. James was Global Director of Disaster Management for World Animal Protection for nine years, providing strategic direction for the organisation’s liaison with national governments, UN agencies and the International Federation of the Red Cross and Red Crescent Societies. During his time at World Animal Protection he responded to many disasters including Cyclone Haiyan in the Philippines, Cyclone Pam in Vanuatu and the Mongolian Dzud of 2016. He has also worked as an international advisor for the British Animal Rescue and Trauma Association (BARTA) and holds an MSc in Emergency Planning and Disaster Management, is a Fellow of the Royal Geographical Society and a Chartered Geographer. James is a specialist in remote field team management with over 20 years of experience. Gerardo Huertas currently works as Global Director of the Animals in Disasters Campaign for World Animal Protection. He has over 35 years of experience delivering disaster relief for animals across the world, including post-war operations in Nicaragua, Kosovo and Afghanistan, and other events such as the Haiti earthquake and the Indian Tsunami. His work has pioneered innovative solutions to climate change adaptation and diaster risk reduction for animals. His current role focuses on the most disaster vulnerable countries in the world and campaigning for the integration of animals into national policy frameworks. He holds an MSc in Biology, Human Resources and advanced studies in Law and Project Management.